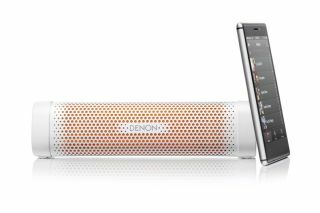 Denon takes wraps off £99 Envaya Mini wireless speaker | What Hi-Fi? Denon has unveiled a new Mini version of the Envaya – its portable Bluetooth speaker that first made its debut earlier this year and served up "a seriously weighty and powerful sound" in our testing rooms. In fact, we found the Envaya to offer "ridiculously meaty, powerful sound" for a portable speaker when we cast our eyes (and ears) over it – and now Denon claims it has squeezed that same power into this smaller unit. The Envaya Mini DSB-100 is expected to hit the UK shelves next month [December] with a price tag of £99. It'll come in two finishes: black with blue grille, or white with orange grille. In much the same vein as its sibling, the Envaya Mini comes with aptX Bluetooth connectivity to let you stream CD-quality tunes. And its NFC pairing means that you can connect compatible devices with just one touch. Under its exterior, the speaker includes dual 40mm Full Range Drivers and 40 x 83mm passive radiator. It can be placed horizontally or vertically, and is also said to be water resistant as well. A Denon spokesperson said: "The Mini offers the same revered Denon sound quality, but now condensed into an even more compact, suave, colourful and water resistant package."